My customers frequently challenge me in terms of the designs they ask for. In the last twelve months alone I have been asked for everything from Optimus Prime, edible Lush Bath Bombs and caravans to Lady Gaga, chandelier wedding cakes and Art Deco Flapper dresses. One such challenge was the first of this week's cakes. The recipient is a huge fan of Bram Stoker's Dracula - the film featuring Gary Oldman and Keanu Reeves - so the brief was to recreate the original movie poster artwork. I had a rough idea how I would do this one. Essentially I had a couple of options: I could print an edible image of the entire graphic onto an icing sheet and just stick that onto a round cake. 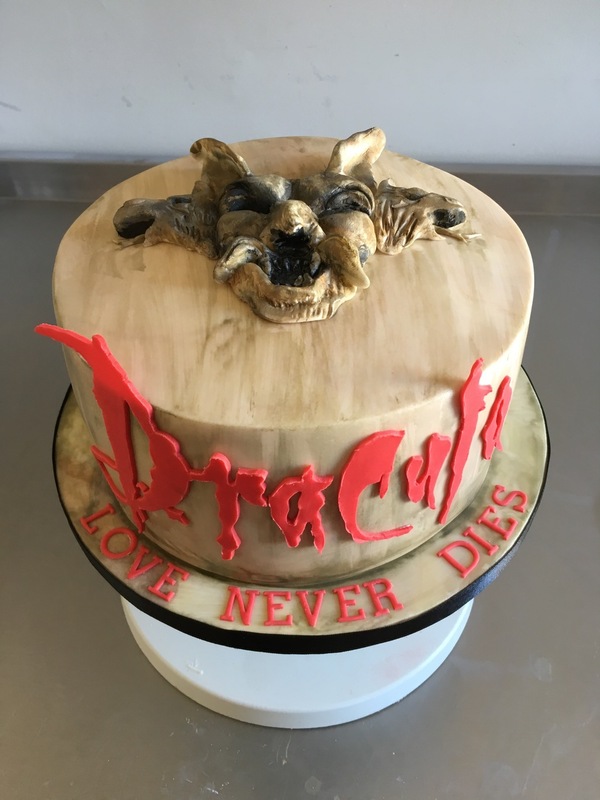 Alternatively I could "animate" the gargoyle with fondant or modelling chocolate, basically modelling it and cutting out the Dracula lettering by hand. I decided to go for the latter as I knew if I got it right the effect would be much better. More time consuming, but much more effective. Fondant gargoyle, still sticky with some tentative shading. So, instead, I decided to work it in fondant. Often sculpting with fondant doesn't work as it's much harder to blend in joins and cracks than with chocolate, but for this, I actually liked the cracks visible as the gargoyle is supposed to look like stone. I was fairly happy with the first attempt at this, but I decided to leave it overnight to set before I decided whether I was going to paint and dust it properly. The next stage was the baking of the cake which needs no explanation (hint here, don't forget to add the eggs, like I forgot to do with a cake the other week, then wondered why it looked weird and wasn't rising - I blame tiredness!) but as the cake was cooling, I applied the first layer of colour to the gargoyle's head. It was quite patchy and blocky at the point - the shading will be done when this coat is dry. First colouring. Looks kinda blocky at this point. As I waited for the red gum paste to be dry enough to cut, I ganache my cake with a creamy white chocolate ganache. Then, as this was setting in the fridge, I went back to the letters and cut them out. By the time they were cut, the ganache was hard enough to cover in fondant. As the picture above shows a sort of stone-effect, craggy background, I decided to marble my fondant using a mixture of white, chocolate brown and pale yellow. After applying the fondant and smoothing any noticeable bumps, I then distressed it with a dusting of colour then brushed it with alcohol to "drag" the colour. Then I added the gargoyle, stuck the lettering in place and left it alone to dry and set.